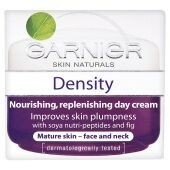 Density day cream is specially formulated for mature skin. It is our first nourishing moisturiser with soya nutri-peptides and fig, to improve skin's elasticity, tone and plumpness. Research has revealed soya nutri-peptides as being effective in stimulating cell renewal and reinforcing the skin's structure. We are able to capture the soya nutri-peptides in their pure and most active form through an innovative extraction process. Density improves skin elasticity and tone - instantly. The Result: skin is nourished and its structure is reinforced. The skin's plumpness is improved to feel years younger. Aqua/water, cyclohexasiloxane, glycerin, squalane, hydrogenated polyisobutene, glyceryl stearate, cetyl alcohol, peg-40 stearate, myristyl myristate, octyldodecanol, ficus carica/fig extract, hydrolyzed soy protein, hydrolyzed rice protein, acer saccharinum/sugar maple extract, citrus dulcis/orange fruit extract, citrus limonum/lemon extract, saccharum officinarum/sugar cane extract, vaccinum mytrillus/vaccinum myutrillus extract, ethylexyl methoxycinnamate, acrylates copolymer, butylene glycol, c13-14 isoparaffin, isobutane, laureth-7, polyacrylamide, propylene glycol dicaprylate/dicaprate, sorbitan tristearate, tocopheryl acetate, xanthan gum, tetrasodium edta, butylparaben, chlorophenesin, ethylparaben, imidazolidinyl urea, isobutylparaben, methylparaben, phenoxyethanol, propylparaben, parfum/fragrance, alpha-isomethyl ionone, benzyl alcohol, benzyl salicylate, citronellol, coumarin, geraniol, limonene.